If you’re a history lover, Malta is going to feel like a playground to you. You don’t even need to visit museums but you can include these on your itinerary. If you’re wondering where to go… history is everywhere, on the corner of every street, in some parts of the island. The best place to begin for a history lover in Malta is, of course, the history books. Once you’re familiar with the stories of the Knights of Malta and the Great Siege of 1565, every corner of Senglea, Birgu and Valletta will speak its stories to you. When putting together an itinerary, we suggest visiting the museums first and then taking to the streets to see the living history. The first places you want to visit are the Palace Armoury and the Museum of Archaeology. Both can be found in Valletta within a few minutes’ walking distance of each other. It’s very easy to get there with a GoTo car and there are reserved parking spaces for GoTo car sharing cars just a few minutes away. Here you will see the canons, guns, swords, tools and suits of armour used by the Knights of Malta. The Museum of Archaeology also has an amazing collection of original coins from the era of the Knights. This permanent exhibition is one of the gems this museum has to offer. 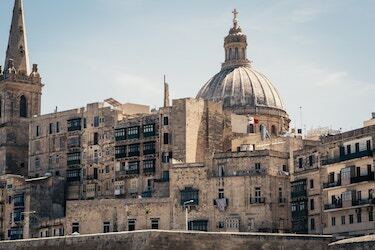 You also want to take a walk in Valletta to enjoy the architecture, find the auberges and spot the various Knights’ coats of arms on prominent buildings. If you want to enjoy the historical architecture, we recommend visiting Valletta at night when the lighting accentuates the architectural shapes and makes these historical features much easier to enjoy. In the morning, Valletta is a shopping and tourist hotspot, so it can be more difficult to enjoy the architecture when it’s busy. 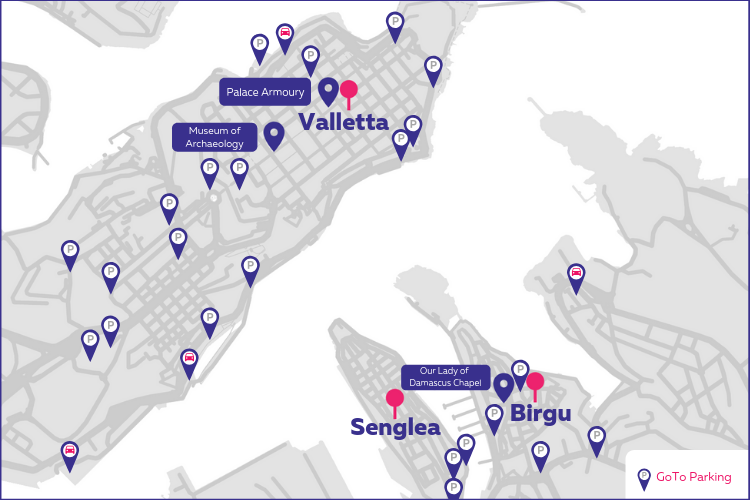 Once you’ve absorbed all the stories Valletta has to tell, you can make your way to Birgu and Senglea. Birgu still houses the original sword and hat of La Vallette. He was the Grandmaster that lead the fight during the Great Siege and the man who gave his name to Valletta. Because he is such a prominent figure in Maltese history, some argued that La Vallette’s ceremonial sword, displayed at the Louvre in Paris, should be returned. However, the sword that La Valletta actually used during to fight during the siege and the hat he wore are still in Brigu. They can be seen at the chapel dedicated to Our Lady of Damascus in Birgu (Vittoriosa). La Vallette left them as an offering of gratitude to Our Lady of Damascus by donating them to the chapel, where he prayed during the Great Siege. This chapel is located close to the tower that La Valletta used to watch the harbour. Birgu housed the auberges of the Knights before Valletta was built. Walking the streets of this historical city is enchanting. The old architecture is amazing, and you can spend the best part of the day wandering these streets in awe. Getting to and from Birgu with GoTo cars is also very easy. GoTo reserved car sharing parking spaces are located just outside the Malta Maritime Museum, right next to the restaurant lined water front of Birgu and just a few minutes away from the Inquisitor’s Palace and the Chapel of Our Lady of Damascus. If you like to be in charge of your itinerary and take your time to explore historical sites, GoTo is the best way to get around. Register before you arrive in Malta.